It’s not a small job to replace the roof on your commercial building. It’s seen as something that “must” be done, instead of something that a building owner or property manager “wants” to do. Most companies don’t look forward to it. However, we look forward to every roofing project we’re chosen to complete. Because it isn’t looked at as a positive experience, most property owners and managers want to spend as little money as possible to replace their commercial metal roof. Every building is unique, so figuring out the cost of your commercial metal roof replacement is dependent on several factors. So, let’s take a look at the main principles behind replacing your commercial roof rather than specific figures. You can visit some websites that attempt to estimate the cost, but, since each roof is unique, they are seldom very accurate. The Size of the Project – Obviously, how big your roof is will have an impact on your cost. You have to factor in the height (lifts and special equipment may be needed) and the dimensions of your building. The Features You Have on Your Roof – You may have things like hatches, parapet walls, chimneys, vents, skylights and drains on your roof. They may have to be removed and reinstalled with flashings and barriers during the install process. This will add expense and time to your replacement process. Does Your Current Roof Need to be Removed? – Removing your existing roof will add significant expense to your project. You can replace your current metal roof in 3 possible ways: removing the existing roof, installing a new roof over the existing one or restoration of the current metal roof. If the option you choose is to remove and replace the old roof, you’ll need to add cost and time to your project assessment. You can eliminate this step, saving money and time, choosing one of the other 2 options. 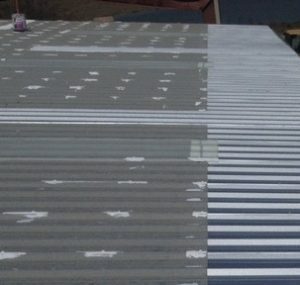 Restoration of Your Existing Metal Roof – Doing a complete metal roof restoration by fixing all the issues and applying a silicone spray coating directly over the top of the completed repairs is how this would work. This way, you don’t have to complete a tear-off of the existing roof and completely replace it. At the end of their useful life, the restoration products used can be recycled for the next project. This means you’ll save even more money when the warranty expires and you can quickly renew the roof to extend its useful life once again.What this means is that when the restoration’s useful life is over and the warranty is done, you can renew it again with the same process. Installing a New Roof Over the Old One – You can also avoid the tear off of your existing roofing materials by installing a second one over the top of it. However, it could mean that when the new roof’s life is over, you’ll need to tear off both of them instead of just one roof. It would push the expense of the tear off out into the future instead of causing a major addition to your cost now. How Much Debris You Need to Dispose Of – As mentioned, tearing off your existing roof will produce a lot of waste and debris. This will add costs and time to your project and add to your already overflowing landfills. When a roof is torn off you have several ways that expenses will accumulate: dumpsters will be needed, roof decking will need repairs, insulation will probably need to be added, and of course, the labor needed. The waste and debris obviously produces waste, which costs money and will need to be added to your estimate for the project. New Roof Replacement – After you decide whether you’re going to remove your old roof, you can now consider replacement. The cost of your replacement will depend on the type and design of the materials chosen for your new roof. When making your calculations, these different material choices should be factored into your estimate. Metal roof restoration would be the least costly option, with a complete replacement of your metal roof even less costly than BUR or SPF. Long Term LifeSpan Cost – Lastly, you must consider the costs of future maintenance and operation in your overall decision. Commercial metal roofing systems have long lifespans, but without proper maintenance, they will break down with leaks and repairs over time. A full commercial metal roof restoration will be your least expensive option. It will need to be maintained properly also, but when the lifespan is complete, it can be restored again, extending your roof’s life even more. For your roof’s particular needs and requirements, consult an experienced, professional commercial roofing contractor and get estimates for several options. You can then decide which option,, replacement or restoration, is best for your building and your budget. Taurus Elite Commercial Roof Systems, 512-332-4422, provides commercial roofing services to Austin, Texas and the surrounding communities, including Cedar Park. This includes commercial metal roof repair, commercial metal roof restoration, commercial metal roof replacement and commercial flat roofing services. We have been providing professional commercial roofing services to the area for over 20 years.